ÅF has played an important role in Nattljus, a festival organised by the municipality of Eskilstuna to highlight the potential of using lighting in urban areas. 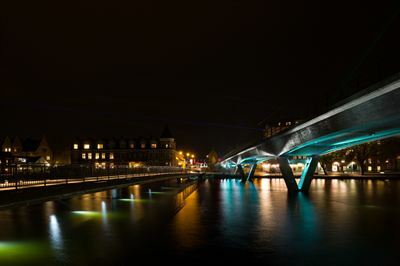 For the first time ever, the municipality of Eskilstuna in Sweden is organising the Nattljus light festival in order to highlight the municipality's great believe in the potential of using lighting in urban areas. ÅF’s lighting team has played an important role for the municipality in this effort and will inaugurate two permanent lighting installations and a temporary light display during the festival. "Through its light festival, the municipality of Eskilstuna shows its high level of ambition when it comes to working consciously with light and lighting as a part of the city's architecture and apperance. Our talented team has worked intensively over the recent weeks to create lighting installations that accentuate the city's history and the architectural qualities of the city's public spaces," says Kai Piippo, Chief lighting designer at ÅF. The Nattljus light festival runs from 23 October until 2 November. During this period, three permanent lighting installations will be inaugurated around the town, as well as several temporary lighting installations designed by different lighting designers or lighting artists. In parallel to the festival, Eskilstuna will host an international conference on lighting, Light in the City, where Kai Piippo will hold an inspiring talk on the role of lighting in the city of the future. ÅF’s installations for the Fristadstorget town square and the foot and cycle bridge are of great significance to the new cityscape and are permanent installations. The temporary installation called "Den Lyckliga Väggen" (Happy Wall) on the Fortifikationsverket building can be contemplated throughout the festival's eleven days. "Eskilstuna's focus on lighting and the light festival shows how a municipality can work with lighting to highlight the city's public spaces. We hope that more cities like Eskilstuna will focus on lighting as an opportunity to promote pride, identity and encounters between people which even leads to a safer city," concludes Kai Piippo. Please contact Kai Piippo for any questions about the project.